4313 Betty – Bellaire – 4/3.5/2 New Construction just finished – $725,000. 5537 Huisache – Bellaire – Custom contemporary 3/2.5/2 w/ pool – $615,000. 1945 Haddon – Hyde Park – 4/3.5/2 New Construction townhome – $749,000. 1702 Woodhead – Hyde Park – 4/3.5/2 New Construction townhome – $718,000. These are fabulous homes that are definitely worthwhile seeing. Let me know what you think of them after you see them. If you can’t make it by the actual properties, please view them on our website or give us a call and we’ll open them up for you to view. LARS BANG’S HOME – IT’S OFFICIAL! It’s now official! 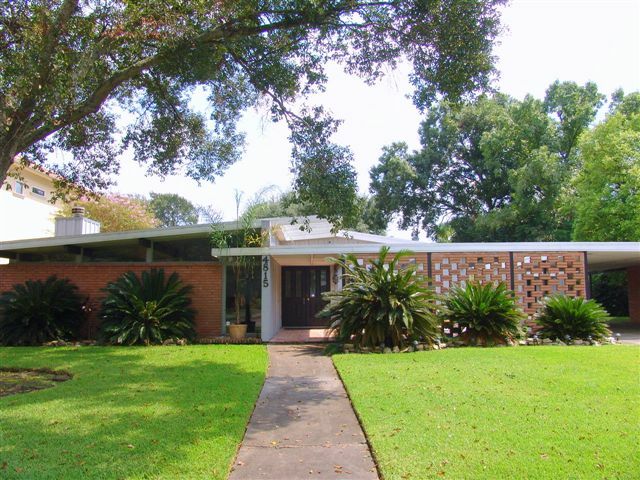 4815 Braesvalley in Meyerland is truly a mid century MOD contemporary home that was designed by the famous Lars Bang. A very knowledgeable person suggested that it might be, so we checked it out further. A week or so ago we had Lars Bang come by the Braesvalley home in an attempt to authenticate the fact that he built it. Lars Bang must be in his 80’s or so. He had a friend of his drive him to see the home. He has a very outgoing personality and it was believed that he was excited about the possibility of it being one of his homes. My husband, Jim, helped him out of the car and invited him into the house, but Mr. Bang’s knees aren’t what they used to be . . .and he just wanted to stand out front and look at the house. After some time he decided that he could not confidently say whether the home was one of his designs or not. The owner was so disappointed when she heard the news. She really wanted it to be one of his designs. Weeks earlier she received an email with a design that looked very similar to her home. So we just kept our fingers crossed. An agent from my office attended a broker’s open house that I had at the home. She is a strond mid century mod fanatic and provided me with invaluable information about the style of home. 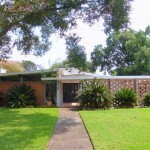 She also suggested that the Meyerland Homeowner’s Association might have the original floor plans for the home . . .and that I should check it out. So I did. I called them last week and was told that they could probably check on the file today. I got a call from a representative of the association and found myself holding my breath until he gave me information concerning the file. He finally found what we were all hoping for . . .the original plans that had been turned in prior to the construction of this home. He told me that Lars Bang’s name was on the plans. He then proceeded to tell me that Mr. Bang was very famous (I already knew that) and that he thought Lars Bang had passed away. He was pleasantly surprised to learn that Lars Bang is doing well. I was so very excited to call the owner of this home and to tell her that she indeed has a Lars Bang home. She’s very, very excited and truly hates having to sell the home. She really would like to stay there, but she just can’t. I’m going to make her a copy of the plans that I borrowed from the association. Now I have to figure out how to get them signed and dated by the famous Lars Bang. So now I have a big question for you. I am marketing this home with an asking price of $449,900.00. Since we have validated the fact that this home is a Lars Bang home . . .should we ask more for the home??? Please let me know what your thoughts are. I look forward to hearing from you. Susi McCauley, a buyer’s agent with our team, The Zoller Group of Keller Williams Realty, is going to hold this home open Sunday. Braesvalley is a Mid-Century Mod home that could have possibly been designed by the well known architect, Lars Banks. Mr. Banks actually stopped by this home last weekend to see if it was one that he had actually designed. We think there is a good chance that he did, but Mr. Banks could not confirm it himself one way or another. A representative of the Meyerland Homeowner’s Association is going to try to find the original blueprints that had to be filed when the house was originally built in 1946. We’re keeping out fingers crossed that Lars Banks was the designer. I’ll let everyone know whether or not he is. This Meyerland home is very unique, inviting and casually elegant. You will be fascinated with the multiple living areas featurings walls of windows while ensuring your privacy. There is a sunken living room, wood burning fireplace, formal and casual dining, breakfast bar, well lit gameroom/sunroom, family room with built-ins, master bedroom with a Japenese flair, grand courtyard and nice sized back yard. You will enjoy making this 4 bedroom, 2.5 bath room home your new home! There is a 2 car garage and a large carport that make parking pleasant. You’ll also enjoy the desert garden in the front courtyard. We hope that you can make it by on Sunday. If you can’t, please contact us and we will get you in to see this home. You don’t want to miss out on seeing it! Imagine having the right to live in a personable and delightful stucco and stone home where casual elegance exudes . . . this home can make your dream come true!! The builder, HJE, and his architect put a lot of extra thought into planning this dynamic design. When you visit this home you will enjoy it’s unique characteristics. We look forward to your visit. Please feel free to contact us to see this home at any time if you can’t make it by the open house this weekend. We’ll make sure that you can see it! The semi-annual Bellaire Arts and Crafts show is Saturday, 10/21/07 from 9:00 AM to 5:00 PM. This event is sponsored by the Greater Southwest Houston Chamber of Commerce. It will be held at Paseo Park, which is the large median of around the 4800 block of Bellaire Blvd. in Bellaire, TX. Admission is free. This event is so much fun! There is a little of everything at this event. Vendors come from all over the state to participate. My daughter and I went to the last festival and ended up buying kettle corn, various home made jellies and canned vegetables and a really odd lamp for my husband for Father’s Day. 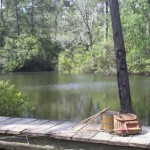 The lamp has a wooden base which supports the handle and a portion of the fishing rod. The handle of the fishing rod turns the light off and on when it pulls on the lure. The lampshade is an old metal bait bucket which is turned upside down. I can’t say that it’s anything pretty. . 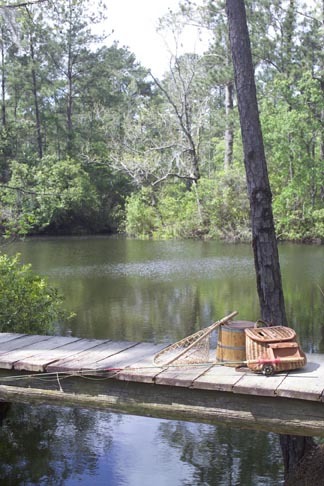 ., but I can tell you it is one of a kind and will go well in the log home we’re building in East Texas at Artesian Lakes. For now, it’s sitting in my traditional family room and has become quite a conversation piece. The whole point of the story was to let you know that you can definitely find most anything you are looking for at this festival. Take some time to enjoy this arts and crafts festival in this fabulous fall weather we’re having right now. You will be amazed and dazzled by what you see in these homes when you view them. Every year the homes offer so many new design ideas. I hope you have the opportunity to view them. Have fun!!!!! Please check when you buy your ticket to see if all the homes are open each weekend. It’s possible that one may not be open one weekend. If you don’t have a chance to see these fabulous homes during the Bellaire showcase, please contact Jim or me and we may be able to arrange for you to see the homes at another time. I obtained most of this information from the website for The Bellaire Fall New Home Showcase. Gorgeous 3 story, casually elegant townhomes offer 3700 and 4066 sqaure feet, 4 bedrooms, 3.5 bathrooms and 2 car garage. Each townhome features include formal living and dining rooms, family room, gameroom, 2 laundry rooms (1 on first floor and the other on the second floor), master bedroom on the first floor with a second possible master on the third floor, gleaming hardwood floors, granite kitchen counters, balconies, and beautiful finishes. These homes are new construction homes that are ready to move into. Please come by and visit these beautiful townhomes. You have a terrific view of the downtown Houston skyline from the Woodhead property. Imagine making one of these your new home. . . and then make your dream a reality!